Los Angeles Unified School District officials have made a new contract offer to the district's teachers union, hoping a pledge to spend more money on key union demands — chiefly, reducing class sizes and hiring more staff — might solve a nearly two-year-old labor dispute. But there's still no agreement that might prevent more than 30,000 United Teachers Los Angeles members from going on strike as early as this week, causing a disruption for the families of LAUSD's 484,000 students. United Teachers Los Angeles leaders called LAUSD's new offer "inadequate," saying the two sides still have significant differences over how to regulate class sizes in the district. UTLA continued to fault the district for demanding concessions on retirement benefits in exchange for a salary increase. District leaders continued to insist LAUSD doesn't have as much money as the union says to spend on a new teacher contract. Monday's meeting was the first face-to-face negotiation since Dec. 3. To demonstrate how serious they were about the talks, both UTLA president Alex Caputo-Pearl and LAUSD Superintendent Austin Beutner personally joined the negotiations. After weeks of minimal movement, Monday's session yielded big changes. UTLA dropped several demands that had been sticking points — the first major changes the union has made to its position since submitting its "last, best and final" offer in July. The two sides plan to return to negotiations on Wednesday morning. But in a press conference afterward, Caputo-Pearl characterized the progress as minimal — and the two sides as far apart. 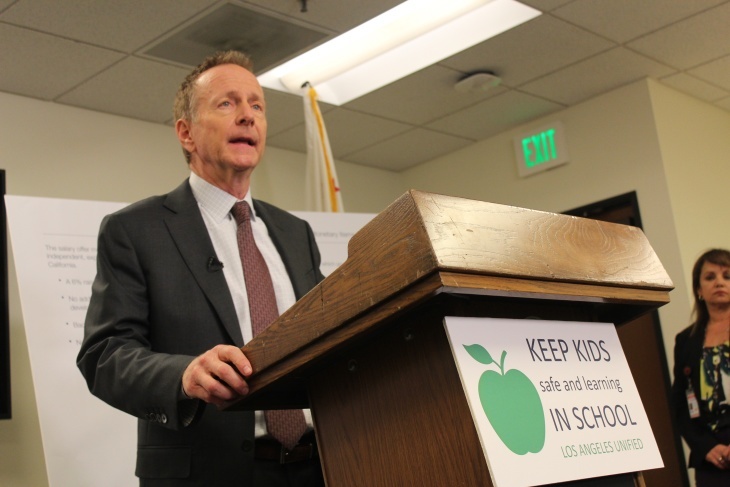 "We were surprised that the district came in today with so little to offer," the teachers union president said, "so unless something changes pretty significantly, there will be a strike in the city of L.A."
"We don't want a strike," Beutner said during his own press conference. "We don't believe a strike will produce more money to reduce class size. We don't believe a strike will produce more money to increase the wage." When the strike could begin is still unclear. 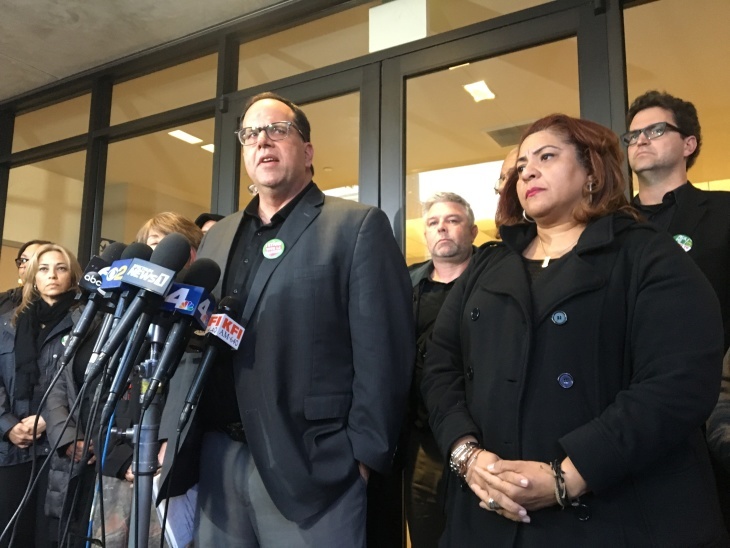 The two sides will go to court Tuesday morning to ask a judge whether UTLA could begin a strike — as they planned to do, barring a last-minute deal — on Thursday, Jan. 10. The union conceded that a legal snafu could push the strike back to Monday, Jan. 14. For months, UTLA has called for removing a section of the contract — "Section 1.5" — that essentially lets the district increase class sizes whenever it wants. The district has used this provision to create new class size limits, setting guidelines for larger classes than originally negotiated in the teachers' main contract. Even then, the limit isn't firm: LAUSD tracks its compliance with its own rules based on averages of class sizes district-wide, not the "maximums" spelled out in the guidelines. The union objects to locking in class sizes that are significantly larger than what's in the contract UTLA originally negotiated in 2015, allowing for as many as seven additional students per class in some schools and grade levels. In fact, at his press conference Monday night, Caputo-Pearl framed the district's proposal to "reset" as an "increase" in class size. The district may be willing to strip Section 1.5 out of the contract, as the union wants. But UTLA says the district wants to replace it with new language that it considers even worse than the original — an argument they've been making since LAUSD proposed a similar replacement provision in October. UTLA has long demanded the district ensure every LAUSD school is staffed with a full-time nurse and that every middle- and high school is staffed with a full-time librarian. In some schools, LAUSD only provides a full-time nurse or librarian for a day or two per week — if at all. On Monday, the district said it would fold in some more nursing and library services into its $105 million class size offer. At every LAUSD middle school, the district offered to guarantee "library services" and to double the number of days nurses are available. The parameters of LAUSD's salary offer to the teachers union remained largely the same — a 6 percent increase, including 3 percent in back-pay to July 2017 — though district officials clarified (as they had done informally already) that they would no longer make the raise contingent on teachers completing 12 hours of additional training. In this area, Caputo-Pearl only mentioned one major sticking point during his Monday press conference: the district continues to demand that new employees' put in more years of service to LAUSD in order to qualify for retiree benefits. 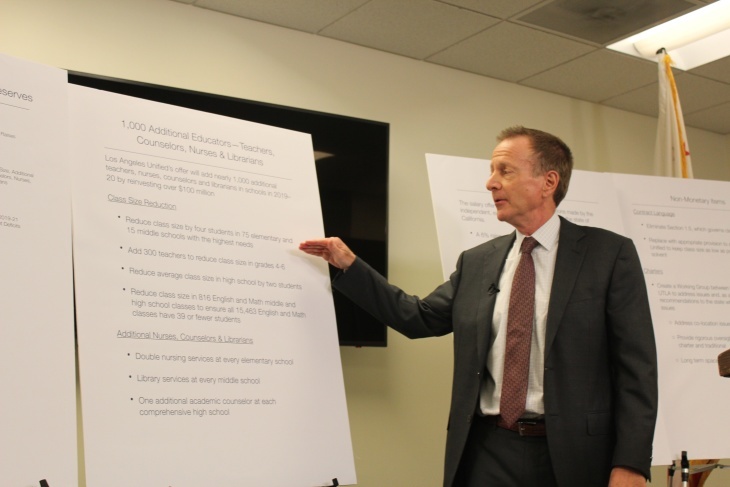 Beutner noted Monday that other LAUSD unions have already agreed to this concession. Magnet schools: The union had hoped that a school's unionized staff would have to vote before any school could convert into a magnet school. The union dropped this issue Monday. Standardized tests: UTLA had proposed that the contract only require teachers to administer standardized tests required under state or federal law. Beyond that, teachers would have had the power to refuse to give any of the low-stakes standardized tests used to track students' progress. The union dropped this issue, too. Local school governance: UTLA had wanted to give Local School Leadership Councils "complete authority over all school-based funding" and other key campus-level decisions. The union dropped this issue. The union also gave up three more technical provisions: on "UTLA rights," on "assignments" and part of its adult education proposal. The union said it wasn't conceding district officials' argument — that these demands couldn't legally be part of their contract. Caputo-Pearl said Monday that the union will still argue their case that these demands are in-bounds before a state labor board in the future.